This First Look guide introduces the Atelier plug-in for Eclipse. Eclipse is a popular open-source development environment with an extensible architecture that enables support for a wide variety of languages and technologies. The Atelier plug-in extends that support to the InterSystems IRIS Database Platform™, bringing InterSystems IRIS™ into the Eclipse 'ecosystem'. When you develop applications with Atelier, you edit and save source files on your client machine. You compile, run, and debug source files on a server instance, using a connection you create and maintain in Atelier. Eclipse is a widely-known open-source development environment. The Eclipse Consortium and other parties provide extensive learning resources. The Atelier plug-in enables you to develop applications in Eclipse using InterSystems technology. The extensive array of plug-ins and extensions available for Eclipse means you can use whatever additional technologies your project requires, all in a single development environment. 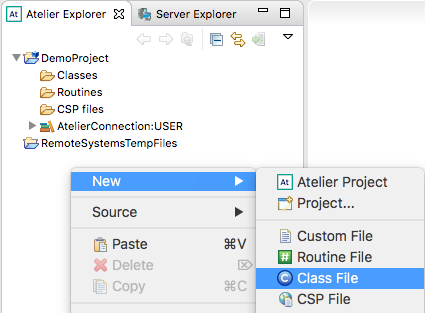 Atelier is able to draw on the powerful debugging capability built into Eclipse. Eclipse plug-ins exist for virtually all widely-used version control systems (VCS), which enables you to use the VCS of your choice to manage development. 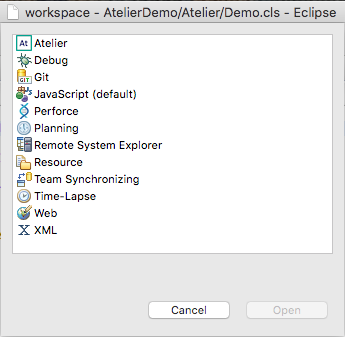 In order to try Atelier, you must first download and install Eclipse. Then you can install the Atelier plug-in. The Atelier Download page describes the steps necessary to get up and running with Atelier. Cheat Sheets that provide step-by-step guidance through basic Atelier tasks. Select Help > Cheat Sheets... from the main menu, open the Atelier folder, and select a topic of interest. You may want to work through the cheat sheets in the order listed, as each one builds on previously covered material. Product Documentation, which is available by selecting Help > Help Contents from the main menu. 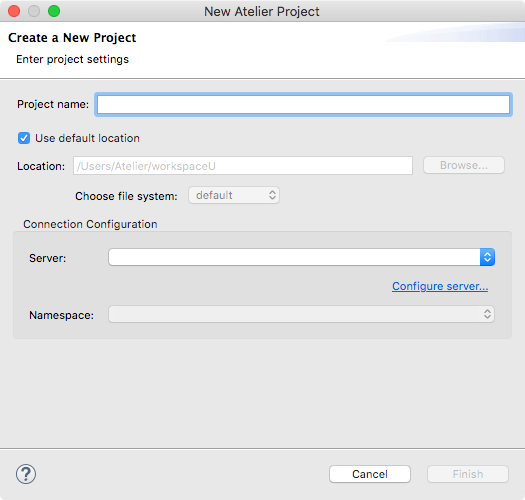 The Getting Started section provides an introduction to Atelier and the Eclipse UI. The Concepts section introduces the major components and capabilities of Atelier. The Tasks section contains topics that walk you through a number of useful tasks with Atelier. The Reference section provides more detailed technical information about Atelier. The next several sections describe how to perform some basic tasks with Atelier. The InterSystems Labs web page lets you easily create your own demo instance of InterSystems IRIS Community Edition, accessible on the web. DNS name or IP address of the instance’s host. Webserver port of the instance. 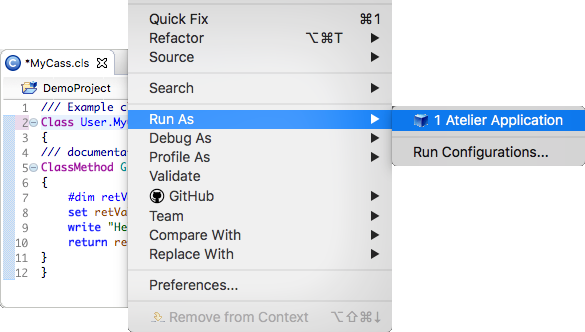 For help in getting this information, see InterSystems IRIS Connection Information in InterSystems IRIS Basics: Connecting an IDE. One of the first tasks you must perform when getting started with Atelier is to define one or more server connections. The following steps describe how to create a connection. Your first step is to open the Atelier perspective. An Eclipse perspective is a set of UI resources, or views, that help you perform a group of related tasks. 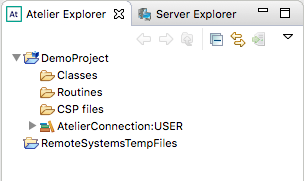 In this case, we need the Server Explorer view, which is part of the Atelier perspective. This button opens a dialog, shown in the next screen shot, that lists available perspectives. Select Atelier and click Open. Now, fill in the fields in the connection wizard. For information about how to obtain the needed information about the InterSystems IRIS instance you are connecting to, see Selecting an InterSystems IRIS Instance. Connection Name: Enter a name to identify the new connection. The connection name cannot contain spaces. Next, fill in Web Server Configuration section. 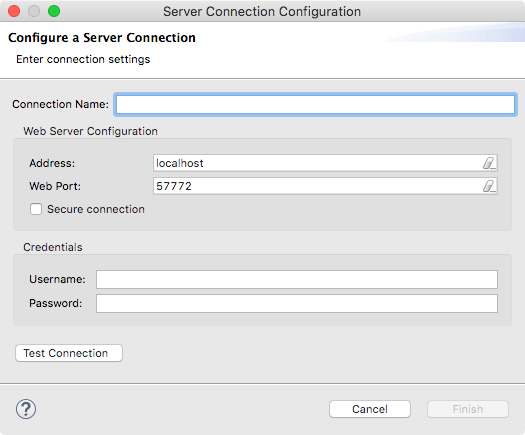 Address: Enter the DNS name or the IPV4 or IPV6 address of the host on which the instance for this connection is running. Web Port: Enter the webserver port number used by the server. Do not enter the superserver port number at this prompt. Secure Connection: Leave this box unchecked. In a real-world application, you would want to use a secure connection, but that's not necessary for this quick introduction. Username: A valid user ID for the instance specified in the Web Server Configuration section. The user must have the minimum required privileges. See Minimum Required Privileges. Password: A valid password for the specified user. Click the Test Connection button to test the connection. You see either "Connection succeeded." or an error message. Once the connection test had completed successfully, click the Finish button to create the connection. The newly created connection is listed in the Server Explorer. You can open the connection node and drill down to examine the resources provided by the connection. Atelier uses projects to organize your work, so your next step is to create a project. Enter a name for the project in the Project name field. We'll use DemoProject. Leave the check box Use default location selected, which puts your new project in your current workspace. Server: Use this drop-down list to select the server you configured in the previous section. If you need to create a new server connection at this point, the button labeled Configure server... opens the Server Connection Configuration wizard for you. Once you have selected a server, use the Namespace drop-down list to select a namespace from those available on the server. This action opens the New Class File wizard. In the Project field, use the Browse button to select the project you just created. In the Package field, keep the default package name User. In the Name field, enter a name for the class. We’ll use MyClass. The Filename field contains the name of the class file as it appears in the local file system. 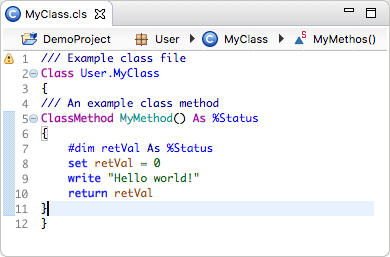 The default value is the class name you just entered, with the extension .cls. The Extends field lets you specify parent classes. This field is optional, and we'll ignore it. 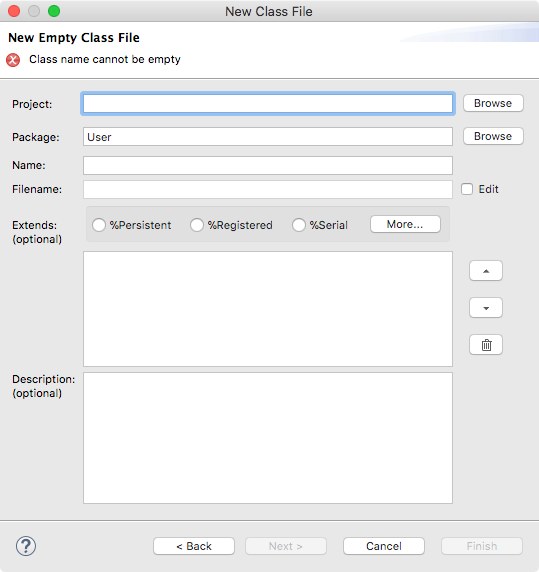 In the Description field, enter Example class file. This field is also optional. Click Finish to create the class file. If you hover the cursor over the small yellow rectangle in the upper-right margin of the editor area, you see the warning: Resource is out of sync in namespace. This problem results from the file having been created and saved on the client, but not yet synchronized to the server. This issue will be resolved when you edit and save the file in a later step. 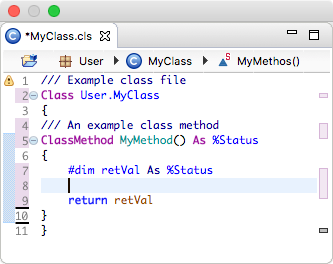 Select the classmethod template and type Enter. 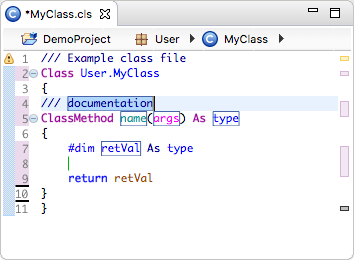 The class editor adds the class method template, as shown in the next screen shot. Right-click and select Save. This action saves the file to the local file system, synchronizes the file with the server, and compiles it. Atelier Videos  Step-by-step videos that guide you through a number of basic development tasks in Atelier. Atelier Group  An online forum in the InterSystems Developer Community where you can connect with other developers, ask questions, and read articles others have posted.